She was born somewhere around 1960, in a small Karen village along the Thai-Burma border. The culture of the Karen people is steeped in elephant lore: they have been living and working alongside these gentle giants since time immemorial. It has often been said that in times past, an elephant would be loved and cared for as if it was a family member. I have been told that Jokia was brought up in this tradition, by a Karen family that loved her as one of their own. In the late 1980s, it became increasingly apparent that cutting down all of the trees on a hill made for a pretty nasty landslide when the annual monsoons came. 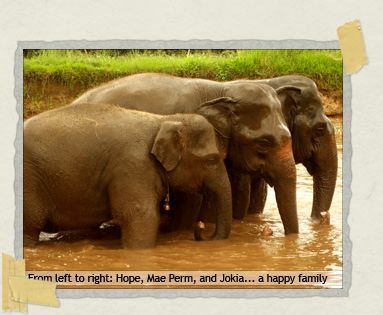 As a result, Thailand outlawed logging in 1989, and (like many elephants) Jokia found herself out of a job. She was sold to an illegal logging camp located to the southeast of Chiang Mai. They would not treat her so kindly. Abuse is somewhat endemic in the world of the working elephant, but in Jokia's case that abuse was taken to the extreme. It only begins with the scars she has all over her body, with the large hole that was torn into her left ear by someone weilding a metal hook. It culminates with her pregnancy, and the tragedy that followed. There isn't really any such thing as "maternity leave" for a pregnant elephant in Thailand. Elephants are pregnant for 18-22 months, and Jokia was worked for that entire period. Horrifyingly, she actually gave birth while in the midst of dragging a log up a steep hill. Her newborn infant rolled down the hill away from her, and she couldn't get to him because of the chains she wore. He didn't survive. Jokia was given no time to recover either physically or emotionally (and elephants are very emotional animals) from what had just happened. At the insistence of her mahout, and the steel hook he weilded, she continued dragging her log up the hill. Angry and distraught, Jokia refused to go to work the following day, outraging her mahout. He pulled the sling out of his pocket, and fired rocks at her face while screaming at her to obey him. Stone after stone struck her right eye, damaging it beyond all repair. Still Jokia remained defiant, and in the end her owner had no choice but to try and sell her. Because she now had only one working eye, she probably did not sell for much. At her sale, Jokia's new owner was told that she was "stubborn". He determined that he would make her submit to him, and went about it in a ghastly fashion. Believing he had hit upon a sure-fire way to ensure Jokia would have no choice but to become submissive, he fired an arrow into her other eye. And with that, Jokia was plunged into a world of darkness from which she would never return. 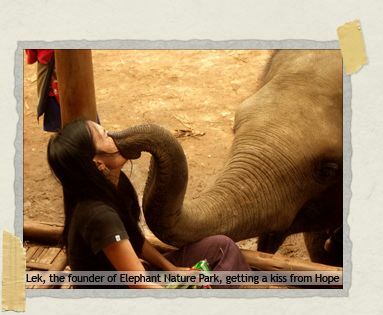 Elephant Nature Park was founded by Sangduen Chailert, also known as "Lek" (which is Thai for "small"). Another program Lek operates is called Jumbo Express, and this offers emergency medical care to working elephants (mainly in very remote areas) who would otherwise receive none. While on one of her Jumbo Express runs, Lek encountered Jokia. "She was screaming, angry, very loud in the jungle... We followed the noise, and saw a man beating her very badly. Her body had many scars and infections. 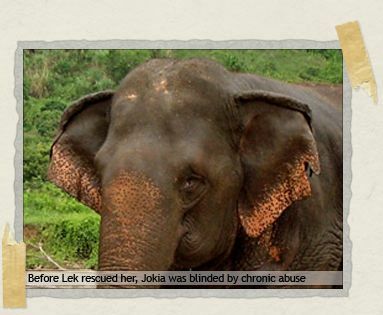 She was extremely skinny and very tired," said Lek, who was devastated at the sight of Jokia. "I think, 'Oh my god, what is going on here?' Both of her eyes had tears running down them. Her tears were so ingrained in her face that I thought she could have been crying for a year." Lek immediately arranged to puchase Jokia, to take her away from the horror of her old life and give her a new one of peace and dignity. At Elephant Nature Park, there are no hooks. Elephants are not worked, they do not perform circus tricks, and they are not ridden by tourists. At the park, they just get to behave as elephants. They choose their own family groups: mothers, adopted-mothers, aunties, big sisters... and friends. 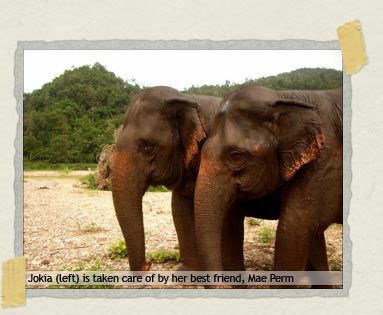 Mae Perm, the first elephant Lek rescued, is Jokia's best friend. More than that, though, she serves as Jokia's eyes. "I like to think that she's telling her everything that's going on right now," said Jodi, our guide when we first visited the park, as we watched the two of them grazing together, rumbling to one another quietly. "You know, stuff like, 'There's some really nice grass in front of you, and all of the dogs are way over by the observation deck, and I think that guy from Animal Planet is filming us right now.'" Or else it's resting on Mae Perm's back or clutching her tail. You can often see them wandering the park's grounds, rumbling to one another, Mae Perm leading Jokia around like children holding hands. They're inseperable these days, and are often accompanied by young Hope, the 5-year-old elephant to whom they serve as "aunties". Jokia was the first elephant we bathed at the park. I remember looking up at her as I scrubbed, gaping at a face pockmarked with injuries sustained over a lifetime of abuse... and marveling at how happy she seemed. Sometimes, while they're grazing, Mae Perm will wander a little too far away from Jokia. Suddenly aware that she can no longer sense her friend, Jokia will panic, trumpeting loudly in distress. And wherever she is, whatever she's doing, Mae Perm will answer. She'll spin on one heel and literally sprint back over to Jokia, trumpeting the whole way. When they reunite, they'll stroke each other's faces with their trunks, and Mae Perm will make little squeaking noises to reassure Jokia that everything is all right. I have to tell you, those little squeaking noises are the most wonderful thing in the world. After everything that Jokia has been through, after all of the horrific abuse she's endured, after losing first her baby and then her eyesight... To see Mae Perm stroking Jokia's face and telling her that everything's all right now really is just the most wonderful thing in the world. That's so touching… what a wonder for you to witness! True soul prickles. Their relationship is so beautiful, the redemption of their lives by Lek and the people who work with her is really admirable and inspiring. so, yeah… this post made me cry a little. first in horror, then in happiness. Its good to know that the milk of human kindness can still be found. Its just a pity it didn't extend to her previous owners. Great pictures – as ever! So devastating and, thankfully, also so beautiful. Thank you. wow. thank you for the grounding thoughts today. Stories like this really want make me hope and pray that karma is for real. I just cannot comprehend how people could be so inhumane and cruel. Thank goodness for happy endings. Perhaps it's a blessing her newborn didn't make it and be subject to the cruelty put upon her. I can understand why some humans (myself sadly included) would feel the need to treat an animal so cruely when it doesn't obey them. However, there is no excuse in the world for the abuse Jokia suffered at the hands of her mahout. I hope that karma does exist and that those evil people get what's coming to them! As for Lek… may she experience nirvana to its fullest extent. It's people like her (and you two hedgehogs) that make this world a better place to live in. This is a beautiful story. That happy ending had me in office-inappropriate tears. Really, what an *experience*. To have witnessed the interaction between Jokia and Mae Perm must have been amazing. How could you punish these people that would not be abuse in itself? I cannot help feeling perverse justice would be served by performing the same acts on them. Sigh. More and more I think the beasts are the more noble of the animals on the planet and the true beasts are man. Now we know where you guys were– and why…what a life-changing experience indeed! You are good karma embodied. We remain in awe of what you have experienced since we left you in Buenos Aires– and have immensely enjoyed the posts of our two favorite hedgehogs.